A grasshopper walked into a bar and ordered a drink. The bartender looked at him and said, "You know we have a drink named after you?" The grasshopper replied, "You have a drink named Stanley?" Schtick happens. For five thousand years, God's chosen people have cornered the market on knee-slappers, zingers, and knock-knock jokes. Now Old Jews Telling Jokes mines mothers, fathers, bubbies, and zaydes for comic gelt. What we get are jokes that are funnier than a pie in the punim: Abie and Becky jokes; hilarious rabbi, doctor, and mohel tales; and those bits just for Mom (Q: What's the difference between a Jewish mother and a Rottweiler? A: Eventually a Rottweiler will let go!). Some are just naughty and some are downright bawdy--but either way you'll laugh till you plotz. With Borscht Belt gags from Brooklyn to Bel Air to Boca, Old Jews Telling Jokes is like chicken soup for your funny bone. I mean, would it kill you to laugh a little? During a twenty year career in the New York film industry, Sam Hoffman has Produced, Directed or Assistant Directed numerous films, shorts, second units and commercials including: The Royal Tenenbaums, School of Rock, The Producers Musical, Donnie Brasco, Dead Man Walking and Groundhog Day.Currently, Hoffman is Executive Producing "The Oranges" starring Hugh Laurie and Catherine Keener. 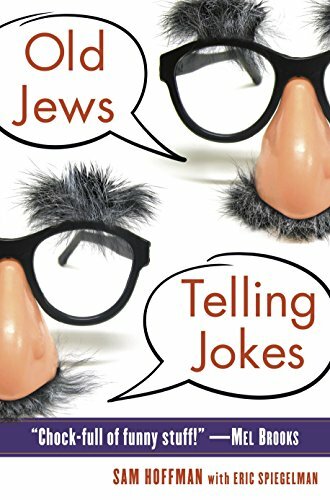 In January of 2009, Hoffman partnered with Jetpack Media to launch OldJewsTellingJokes.com - a website devoted to video portraits of Old Jews Telling Jokes. Since then, the videos have been viewed over 7 million times and have been released on DVD by First Run Features. The site, covered in countless blogs, has been featured in New York Magazine, the Huffington Post and the Wall Street Journal. Hoffman graduated with Honors from the University of Pennsylvania. He lives in New York City with his wife Andrea Crane, a modern art specialist with the Gagosian Gallery, their son Jack and daughter Juliet. Eric Spiegelman produces original Internet content for Jetpack Media, a production company founded by GreeneStreet Films in 2008. Before that, he was a lawyer. Eric graduated from the University of California, Hastings College of the Law and from Boston University. He lives in the Silver Lake neighborhood of Los Angeles.